P.A.I.N.T. is the Program for Arts Integration for New Teachers. 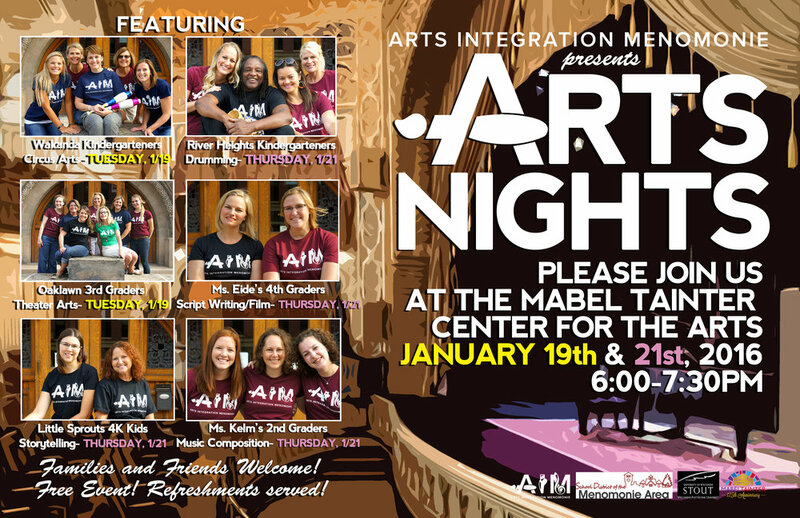 A program of Arts Integration Menomonie, P.A.I.N.T. is a collaborative partnership between the University of Wisconsin - Stout, the school district, and local community organizations. UW-Stout students who are learning to become teachers are given hands-on, authentic teaching experiences through art classes. The Teachers Talk about A.I.M. The teachers of Arts Integration Menomonie talk about the effect the program is having in their classroom. Teaching artists work along side the teachers and student teachers to present school curriculum in an engaging and effective way. UW-Stout Mindfulness Expert, Ann Brand, teaches mindfulness techniques to the teachers of the School District of the Menomonie Area and to pre-service teachers from UW-Stout. The training helps the teachers and students with managing their personal and professional lives. The Teaching Artists of Arts Integration Menomonie discuss their role in teaching curriculum in cooperating with classroom teachers. Babatunde Lea, Kobi Shaw, Charis Collins, Erika Svanoe, Melissa Kneeland, Yata Peinovich, and Kris Winter bring arts to elementary students captivating learning in an efficient way.